Inspirational NFL coach who led the Green Bay Packers to victory in Super Bowls I and II. 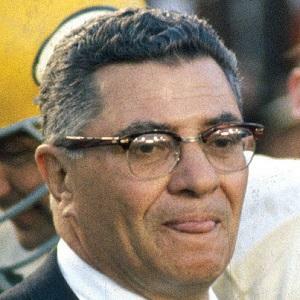 He received the UPI NFL Coach of the Year award in 1959 and 1961 and the NFL's Super Bowl trophy was named after him. He prospered during the Great Depression because of the family butcher shop. He played college football at Fordham University. He never had a losing season during his tenure in the NFL and finished with a career record of 105-35-6. He married Marie Planitz in 1940 and he had two children, Susan and Vince. His quarterback Bart Starr received the first ever Super Bowl MVP award at Super Bowl I when the Packers defeated the Kansas City Chiefs 35-10.